Hello and Welcome! Come on in and I’ll get you a nice large dark roast mix or a cuppa tea or other beverage. It is a very nice, on the warmish side (for date and location) and the sun keeps peaking out. Where are we? Some of you may have seen the photo at the top and know that it is a new one from Cape Cod. It was busy week and I don’t remember much. A lot happening at work. I had a week up in NH, so a lot of work up there. I did have massage, so that was good. I got almost no writing or editing done – I’m so far behind! This entry was posted in Blogging, General Thoughts and tagged #weekendcoffeeshare, casual conversation, chat, coffee, If we were having coffee, informal discussion, personal, Weekend coffee share on April 20, 2019 by trentpmcd. Hello and Welcome! Come on in and I’ll get a a large mug of very strong dark roast. I blended several coffees together as an experiment, and it is good! Anyway, I can also get a cuppa tea or other beverage. It is cool but not cold, unfortunately it is raining, so…. And were are we? 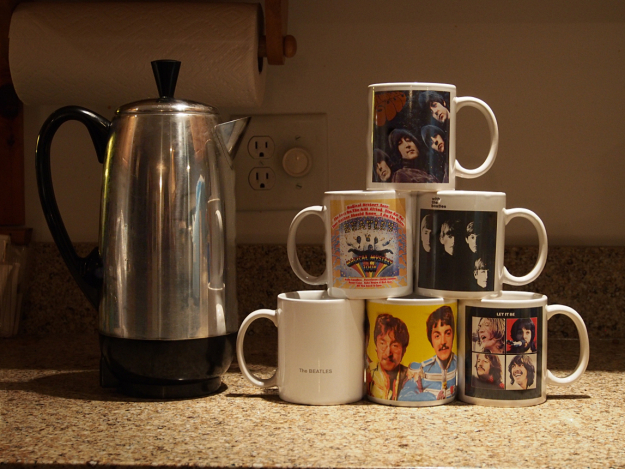 Some of you may know that the stack of Beatles’ mugs is on Cape Cod. This is another week were I was busy but I don’t know what to write… Since I’ve been down here on The Cape, I saw an easel, a bunch of osprey, a black crowned night heron (I think) and other such critters. I did a little work at the new place. I walked on the beach in the rain. I guess I look friendly because I had a few people come up and talk to me out of the blue, including a person who led me to where the eagle was. So a nice little stay. This entry was posted in Blogging, General Thoughts and tagged #weekendcoffeeshare, casual conversation, chat, coffee, If we were having coffee, informal discussion, personal, Weekend coffee share on April 13, 2019 by trentpmcd. Hello and Welcome! Come on in and I’ll get you a nice large mug of very strong French/Sumatra Roast blend, a cuppa tea or other drink. It is a nice day and will get quite warm (for early spring) later. Were are we? Some may recognize that photo as being in New Hampshire. Well, it is finally spring here. I have seen several types of flowers, I saw a snake, bugs, osprey, etc. Spring! We’ve had a few cold days, but, hey, this is New Hampshire! We do not have warm early springs. Typically the heat stays on until late May when suddenly the leaves come out and late spring arrives. I’ll take these 62 F/ 17 C days for now. Busy week at work. What’s new? I had a couple of after hours calls – never fun – but nothing major and easily fixed. This entry was posted in General Thoughts and tagged #weekendcoffeeshare, casual conversation, chat, coffee, If we were having coffee, informal discussion, personal, Weekend coffee share on April 6, 2019 by trentpmcd. This entry was posted in General Thoughts and tagged #weekendcoffeeshare, casual conversation, chat, coffee, informal discussion, personal, Weekend coffee share on March 30, 2019 by trentpmcd. Hello and Welcome! Come on in and I’ll get you a large mug of a very strong French?Sumatra Roast blend, a cuppa tea or some other warm beverage. It is supposed to warm up out there, but for right now it feels cold and there is snow on the ground. yes, new fallen snow! The sun just came out, so I hope it doesn’t last long. And where are we? This is a new photo at the top, but you may know that it is from New Hampshire. I talk about the weather too much, right? Well, here is some more :) Last coffee share I was celebrating spring. And then I drove back the NH. It was winter for a couple of days :( But then, right on schedule, on the 20th, it became spring. And now it snows… Well, the forecast looks good (but it did two days ago! ), so hopefully we will get spring…. This entry was posted in General Thoughts and tagged #weekendcoffeeshare, casual conversation, chat, coffee, If we were having coffee, informal discussion, personal, Weekend coffee share on March 23, 2019 by trentpmcd. Hello and Welcome! Come on in and I’ll get you a nice mug of strong French/Sumatra Roast blend, a cuppa tea or other beverage. It is a beautiful day out there, sunny and relatively warm. Not nice enough to sit outside. Well, maybe… And where are we? You may recognize that photo at the top as being on Cape Cod. It was a busy week at work with a few small projects and a couple of emergency troubleshooting sessions. Not terrible, but the weekend feels nice. This entry was posted in General Thoughts and tagged #weekendcoffeeshare, casual conversation, chat, coffee, If we were having coffee, informal discussion, personal, Weekend coffee share on March 16, 2019 by trentpmcd. Hello and Welcome! Come on in! Brush the snow off of your shoulders and we’ll get you a nice mug of very strong Sumatra/French Roast blend, a cuppa tea or some hot cocoa. Brrr. Not as cold as it has been, but the snow makes it feel cold. Yep, a typical mid-January week. Oh. That’s right. It’s March. Anyway, some of you may know that photo at the top of the page as being from New Hampshire. This entry was posted in General Thoughts and tagged #weekendcoffeeshare, casual conversation, chat, coffee, If we were having coffee, informal discussion, personal, Weekend coffee share on March 10, 2019 by trentpmcd. Hello and Welcome! Come on in and I’ll get a you large mug of a very strong French/Sumatra Roast blend. 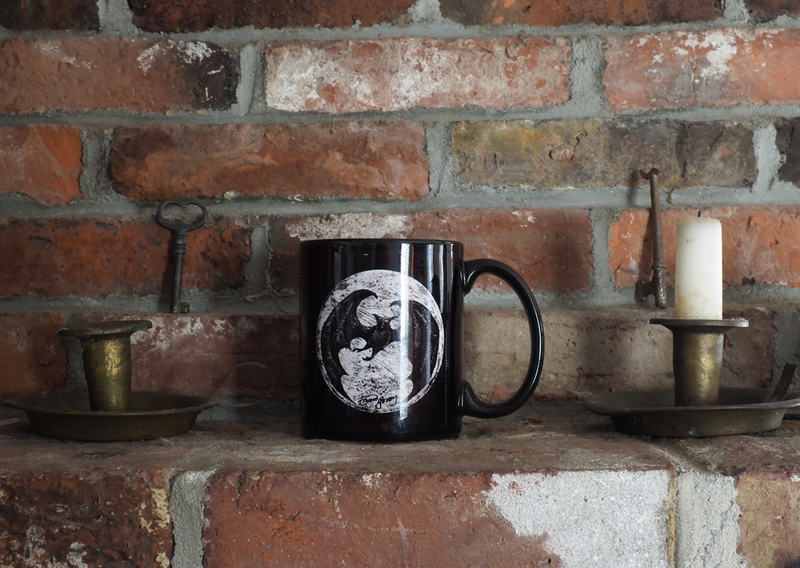 Perhaps a cuppa tea or hot cocoa instead? It is nasty out – snow, sleet, rain, yucky stuff and worse. There are a couple of inches of snow on the ground from Thursday and another storm will come through on Sunday night. Where are we? 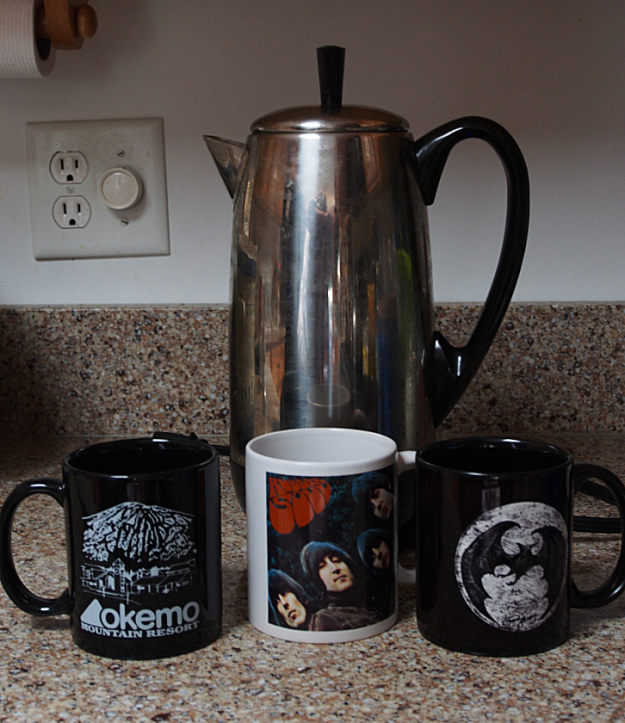 You may recognize the Beatles’ mugs as being from Cape Cod. This entry was posted in Blogging, General Thoughts and tagged #weekendcoffeeshare, casual conversation, chat, coffee, If we were having coffee, informal discussion, personal, weather, Weekend coffee share on March 2, 2019 by trentpmcd. Hello and Welcome! Come on in and I’ll get you a nice large mug of a very warm French/Sumatra Roast blend, a cuppa tea or other warm beverage. I was just out for a while without hat, cloves or coat (I have a thick wool sweater and turtleneck) and my hands are still frozen. It is about 20 F (-7 C) out there now – not frigid, but cold enough. It is sunny and beautiful and should get up to 40 F (5 C) today. A heat wave! And where are we? It is a new photo at the top, but you may recognize it as being from New Hampshire. This entry was posted in General Thoughts and tagged #weekendcoffeeshare, casual conversation, chat, coffee, If we were having coffee, informal discussion, personal, Weekend coffee share on February 23, 2019 by trentpmcd. Hello and Welcome! Come on in and I’ll get you a nice mug of very strong French/Sumatra Roast blend, a cuppa tea or other beverage. Actually, it is approaching lunch time, so something else may be in order. It is a sunny day and beginning to warm up. And where are we? Some of you may recognize the photo at the top as being from Cape Cod. This is one of those weeks that I have a hard time coming up with things that I did. We had a winter storm and so I spent some time on Wednesday shoveling wet, heavy snow. I also had a haircut on Wednesday and drove to the Cape in the evening. I did some writing, but for the most time, after finishing the drafting work of the two novellas and finishing writing the serial story I’ve been posting these last few weeks, I have been uninspired. Or maybe it is just tired since I haven’t slept well. This entry was posted in General Thoughts and tagged #weekendcoffeeshare, casual conversation, chat, coffee, If we were having coffee, informal discussion, personal, Weekend coffee share on February 16, 2019 by trentpmcd.